This book is the definition of a psychological mind booger... I love these kinds of stories, and this one was no exception. It was suspenseful, heartbreaking, unnerving, humorous and even romantic. We'll Never Be Apart hit so many high notes with me, but there aren't a lot of specifics that I can share. I really want to, but there is so much of the story that feels like it would be a spoiler to reveal. So as much as I want to talk about every aspect of it, I will refrain. 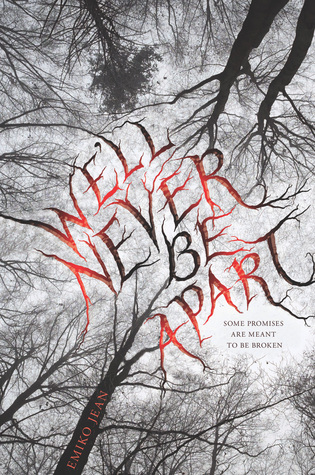 We'll Never Be Apart is a prime example of a story that is better going in blind. Alice is back at the hospital, burns still healing, and full of anger. Anger at Cellie, her twin, who is responsible for the burns, and for the death of Jason, the boy she loves. Full of bone deep fear that Cellie will return to finish what she started. But she has a plan. To get to Cellie first. When she meets Chase, she thinks she has finally found a way to get to Cellie. But she gets so much more than she bargained for. From Chase, and from the realization that not everything is at it appears to be... and not everyone is who we think they are. Even the ones that we love the most. There are so many things to love about this story. There are journal entries throughout the book that chronicle some of the worst moments in Alice, Cellie and Jason's lives. They leave you heartbroken, and sick to your stomach. There is the beginning of a romance between Alice and Chase that is sweet, and hard, and devastating, and beautiful. There is the sweetest roommate, who will make you smile when the tension starts ramping up, who becomes a lifeline, a friend, for Alice. And then there is the big twist at the ending that will leave you a little breathless and incredibly heartbroken, even if you may have guessed what it would be. We'll Never Be Apart is a fast-paced thriller, with incredibly well-written characters, a story that will keep you glued to the pages. There is an emotional overload that happens during the course of this book. Everything that you could possibly want in a story like this one, you will get it here. Emiko Jean is an incredible writer, and her words flow smoothly and quickly. She writes with depth, and has no problem with showing darkness in her words. The honesty of the characters, and their struggles with life and reality, is intriguing and unsettling. I loved this book, beginning to end, and I especially love that the end was full of hope, even if it was a tiny glimmer. I absolutely recommend this book to whoever is thinking about reading it, and those who aren't sure they want to. At least give it a chance! Thanks so much to Edelweiss for an ARC of this book for review. IT in no way shaped my opinion of the story! This looks sooooooo good! I definitely want to read it! Thanks for the review! This is in my tbr pile on my Netgalley books... I definitely need to get to it!